As requested by Phil, am making a new thread which will eventually get compiled into a how-to... I only got as far as the experimentation stage, so hopefully someone will think of a better solution. I know a switch would be the proper way, but it's getting the switch into position A4 permanently and finding a good permanent ground besides the ECU diagnostic cable that will require the most thought. Maybe a simple kit will come out of it. In any case, to add a POWER Mode switch to a USDM car like the JDM cars have, you have to ground pin A4 on the TCU. This is (fortunately) found on the bottom-most wiring harness on the TCU (when looking up at it with your head on the floor). The row of pins on the side the locking clip is on (the "top") will be filled in with wires except for the fourth spot from the "bottom." Do not confuse this with the other row, which has many missing wires (though both possible "fourth" positions have wires on that side). Here is a picture of the harness, including where to put the wire. Please note that your harness will have more wires than mine since I used a few to make this mod. 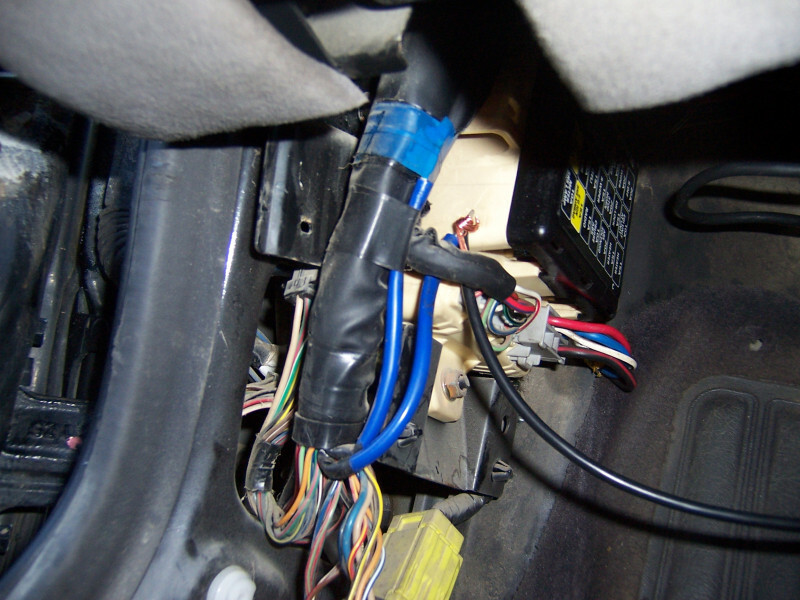 My experiment consisted of merely a length of wire, one end of which was pushed into the TCU wiring harness from the back, and the other end of which was wrapped about the blue diagnostic wire for the ECU. To make this a little easier to understand, here are the photos of the installation. First, this is how it looked. 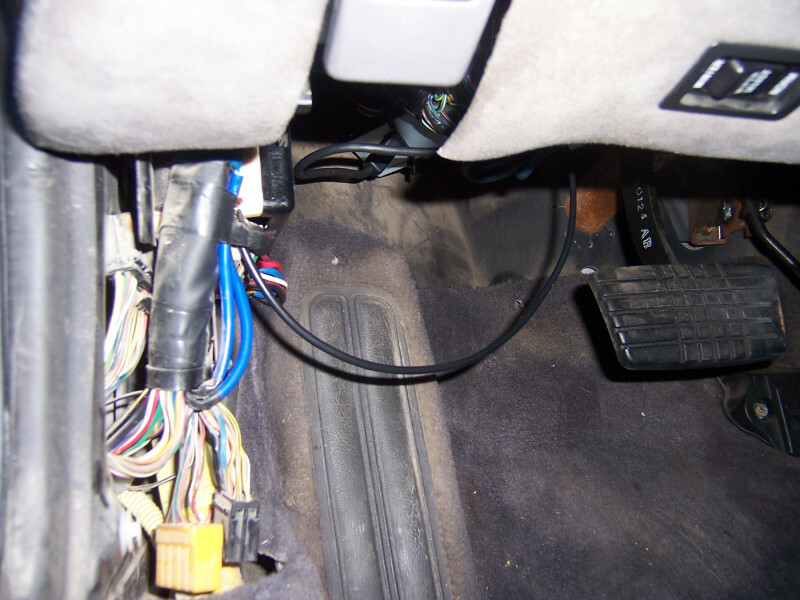 Problem is that you couldn't have your foot on the dead pedal or you'd knock the wire out. Thus the need for a more permanent solution. Next, the best picture I could get of the wire going into the TCU. When the harness isn't in the TCU it's really easy to see where it goes. But with it in there are so many wires that it's confusing. Please disregard the Alpine iPod unit, as it is not standard equipment. 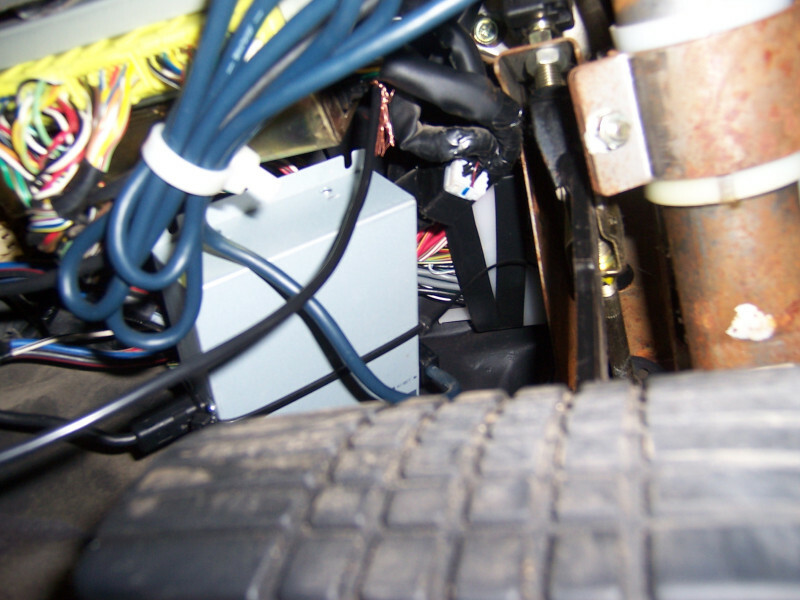 And the other end of the wire, wrapped up with the ECU diagnostic wire. Gotta love having an efficient ground so close to the work area. Thanks, Subaru! That's all for my part. Maybe one of the wiring guys can have a look at the harness and the pedal area and find a good place to stuff a wire and a switch. I am at a loss. 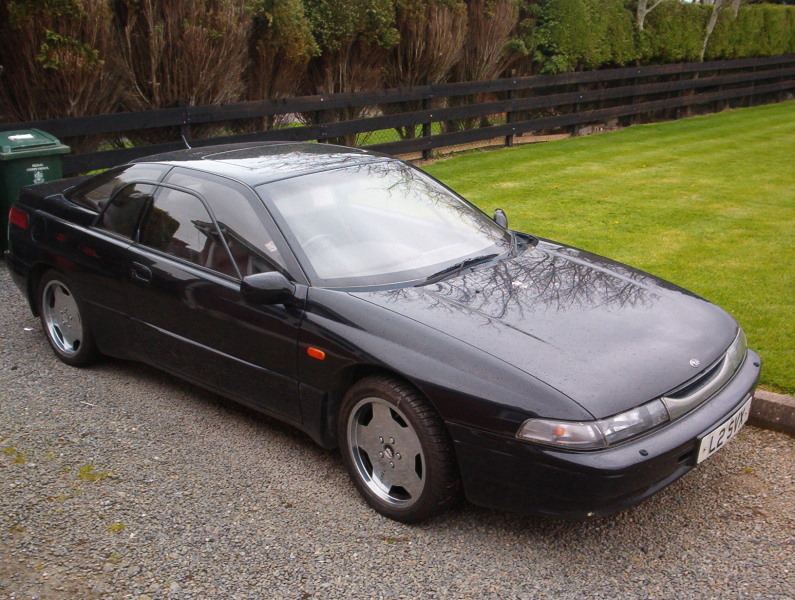 On my 92 LS-l, all I have to do is mash down the gas pedal, and the car does what it is supposed to do. Including the green power light coming on. Why the need for a switch? Aren't all these cars thre same? Thanks for the time. The switch enables you to keep power mode on all the time - even when you're not "mashing the gas". This makes the car much more responsive and gives it a sportier feel. Nomake, I'll check tonight whether the pins I removed from the stereo plug when I made my SSM interface, will click into the empty space on the TCU plug. If they do then I'll send you a couple, since I have no need of them. The JDM power switch is at the back of the gearlever. As far as I remember is just uses one of the grounds nearby. Last edited by b3lha; 05-29-2007 at 01:58 AM. Thanks Phil!!! I'd love to get one of those if it works. I wouldn't install it by the gearshift lever though, personally... I'd probably end up utilizing a spot closer, on the left side of the dash. It'd be really tempting to get my hands on a JDM button though... For now I'll just do it the custom way. Personally i don't think i would wnat power mode on all the time. all you have to do is press it about 1" rapidly and you get power mode, i can activate it while rolling, or from a stop, doesn't matter. If rolling, just let off the gas a bit and give it a quick jerk down, doesn't even have to be to the floor, and you'll hit power mode, and can use it until you ease off the gas for about 5 seconds. Power mode will reduce your milage though, and i don't think i want my car shifting at 6500rpm every time. To each his own though. That's just it though. It's like the power mode that you get when you mash the pedal and the power mode here are different. I was expecting it to just shift at 6500 too, but it didn't. Unless I put the foot down. It'd go up to 5-something and shift. And honestly, it's a lot quicker to respond when it's on like this than when you hit the pedal. It's just there, ready. Whereas the other way you have to either get off the gas or mash it. It just seems to respond more quickly. Totally different. Anyway, you're right; it would kill gas mileage. I wouldn't want it on all the time either. But it's cool enough that I would install the switch for myself. It's a nice thing to have. I did an experiment. I drove one tankfull with the power switch on, and one with the power switch off. I calculated the fuel consumption each time and I didn't notice any significant difference. So now I normally keep the switch on all the time, except on long high-speed cruises. I would go as far as to say its actually slightly better on fuel in slowing moving traffic, I find it hardly ever hunts for the right gear or shifts down unless you want it to, it also gives more engine braking than in normal mode. I leave mine on all the time, when im on a motorway I usually put cruise on anyway and it overides power mode. I think its probably suited better to our gearboxes than the US ones hence why we have a switch. Unfortunately the spare pins from the stereo plug are too large to fit in the TCU plug. Power mode will reduce your mileage though, and i don't think i want my car shifting at 6500rpm every time. To each his own though. Jay, power mode will make no difference to your mileage, or possibly make it 1 mpg worse, that's all. And on top of this what you are saying about shifting at 6500 rpm is absolutely inaccurate. True, if you bury your foot to the carpet, it will do this. But it would do the same on the power-on-demand system you currently have. In everyday use it holds the lower gears a little longer in fulltime power mode, and will change down more easily and quickly for an overtake. Without going to wide open throttle. The nearest analogy I could offer would be that fulltime power mode is a similar system as Sport mode on a BMW gearbox. If you have ever driven one of those, it would feel similar. The only way you can experience the power shift map in US and UK cars is to drive at WOT and keep the foot planted. Naturally this sort of behaviour would affect your mileage. With the power shift map switched on in the gearbox, you don't have to drive like this, you can drive as sedate as you like. The gearbox will allow higher revs in each gear, and the car will feel more responsive. Last edited by svxistentialist; 12-10-2007 at 01:18 PM. As was suggested in the ECU memory dump thread, you are now a LEGEND Nomake Wan. Thank you for experimenting on your car, so I didn't have to risk mine. To get mine into power mode I normally have to hit the pedal several times, speak the names of some dead anscestors, and hold my breath. I tried the TPS "trick" years ago, only to have the car sputter and grumble. This sounds great and makes sense. I'm pretty sure I have some spare ecu,tcu harnesses from my parts car. To cannibalize the female pins from. I am going to go check now. 92 Ebony LS-L "Jabberwerwok" Now includes 1 *free "Wheeeeeee" per ride! 83 Honda Magna v45 "Grendel"
You know the blank button on the right side of the dash, to the left of the rear defroster switch? Is it possible to place a switch into that position? 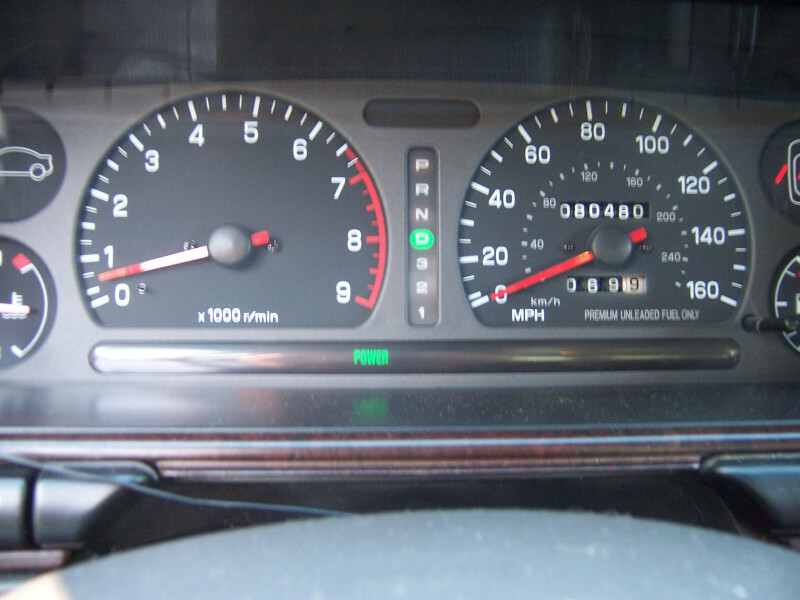 According to memory(the last time I had the gauge cluster out) those switch clusters are "one peice". Meaning they are all housed in one large peice of plastic. If there is a button assembly IN there I'm sure it could be made to function. Or at least it could be made to "push", but I don't think there are any contacts, or "wiring" in there. 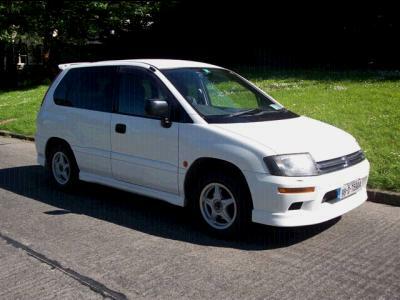 Does anyone have any idea, or pics, of JDM or Euro models? Do they have switches there? 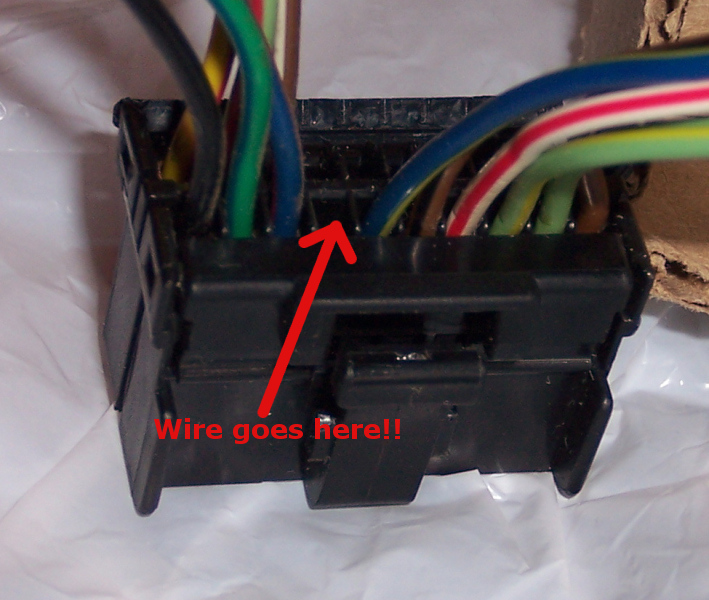 I just cut a small hole in the back of the coin holder to run the wires through, and affixed a generic switch in there. But of course I also have a parts car if I change my mind. 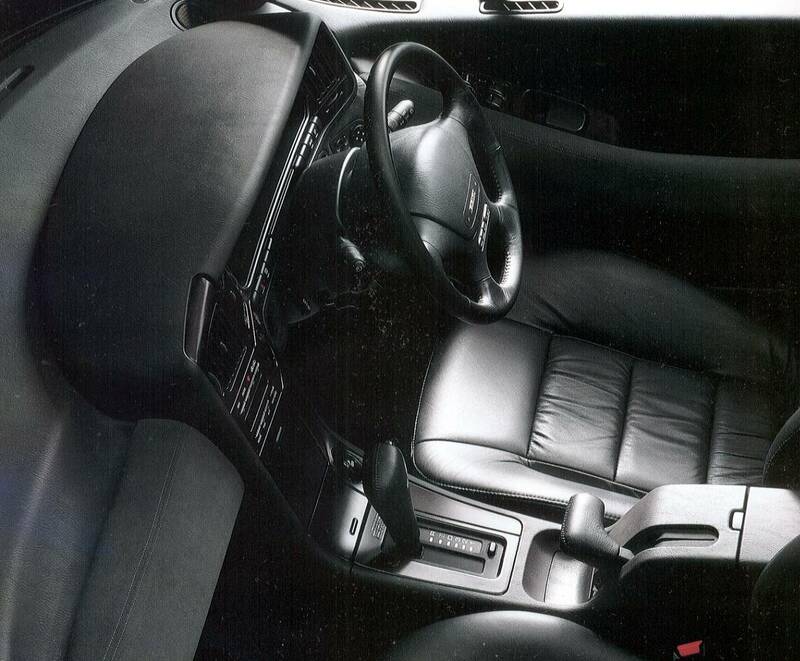 It of course doesn't look stock, but nobody can see it behind the steering wheel anyway. And yeah, they're one piece. I was just kinda hoping or something, I guess. Heh. Last edited by Nomake Wan; 06-04-2007 at 09:22 PM. The Euro and Canadian SVXes have heated-seat buttons in place of the coin holder. Might be easier to get than JDM buttons.